With my history of previously failed 100k attempts, I wasn’t quite sure what to expect at the Cuyamaca 100K this past Saturday. In 2016, I succumbed to an injury just one week prior to the Gorge Waterfalls 100K. In 2017, I didn’t make the cutoff at mile 50 of the Gorge. And just this past May, I missed the start of the Miwok 100K due to a downed telephone pole. I was hoping the fourth time would be a charm. I signed up for Cuyamaca because the cool weather in early October, along with the opportunity to visit my sister in San Diego were too good to pass up. After a successful year of training, I was eager to see how my body would perform. My sister and I arrived at the start on Friday evening, taking advantage of the bunkhouse lodging offered adjacent to the start/finish area (I was also hoping to avoid another telephone pole incident). Early the next morning, runners buzzed around until 6:30 a.m. when we began the first of the three-loop course. Settling into a steady pace while traversing some of Cuyamaca Rancho State Park’s rolling single-track, I felt strong as I approached the first aid station at mile eight. I had somehow managed to avoid my typical race-day gut bomb that seems to arise from a combination of nerves and solid food. Continuing through the first (and longest) loop, we began our nine-mile ascent up to the summit of Cuyamaca Peak at 6,500 feet. Spectacular views and diverse landscapes including manzanita bushes, pine trees and granite boulders helped keep the motivation high when I knew it was close, but remained out of sight. With our next aid station located at the very top, reaching the summit was a relief but also a reason to change gears and prepare for the descent. Unfortunately, most of the trail was covered in sizeable rocks and boulders, so it felt great to finally find my legs again over the last five miles of the loop. My sister had never been to an ultra, much less crewed for one. So when I showed up after the first loop to find all my supplies laid out before me, I was impressed – and anxious to eat the turkey avocado sandwich she had carefully packed. With my hollowed belly finally full, I set out onto loop two with renewed energy. A steep climb right out of the gate is tough with too much food in the stomach, which didn’t bode well for some who were heaving on the side of the trail. It made me question the ease of this 13-mile loop which was shorter, but also more exposed during the heat of the day. 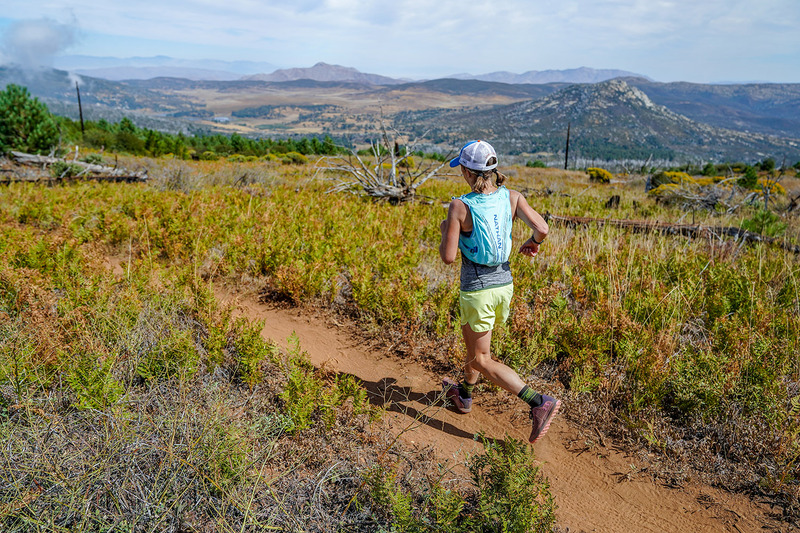 Aid stations at Cuyamaca are jam-packed with everything including fresh fruit, PB&J, bacon, quesadillas and amazing volunteers tending to each runner’s every need. After completing loop two, refueling with broth and grapes, and picking up my headlamp and jacket, I ventured out onto loop three while trying to do some math in my head. How fast could I finish the last 18 miles? My legs still felt strong and I knew that there was a good chance I’d finish earlier than expected. Long gone were the fears of a DNF or freak accident preventing me from reaching the start. I cruised to mile 51 with just 11 miles to go and three hours to do it in, and I was finally able to enjoy running under the stars. In 15 hours and 43 minutes, I crossed the finish line of my first 100k and hugged my sister who’d been waiting patiently. The fourth time was indeed a charm.